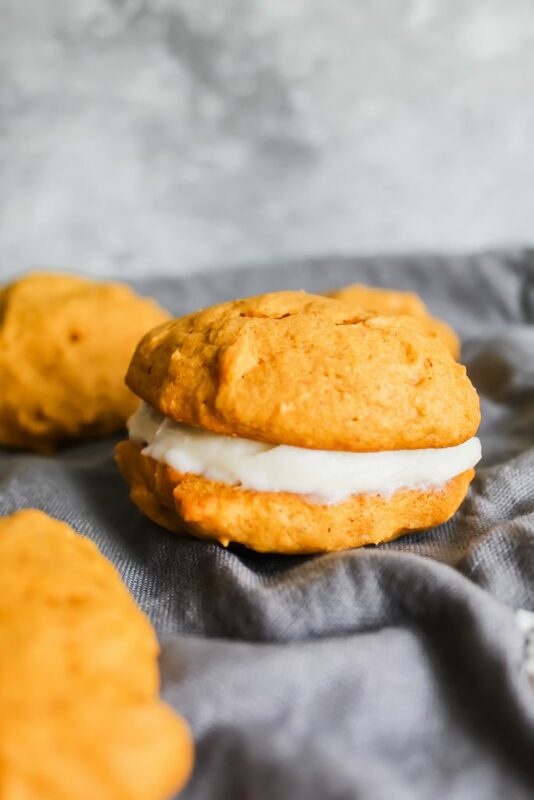 These Pumpkin Spice Whoopie Pies are dense but delicate pumpkin spice cookies filled with tangy, slightly sweet cream cheese frosting! A wonderful treat to bake during the Fall season. Happy October, y’all! 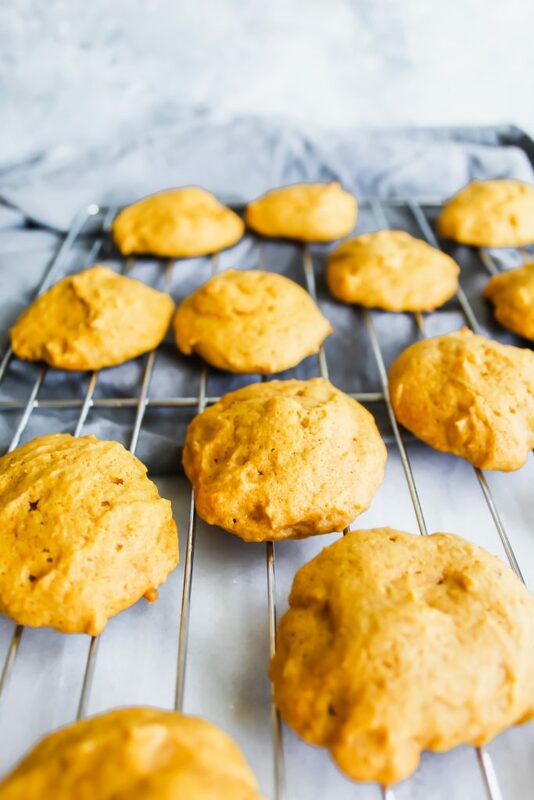 We are kicking off my favorite month with my second pumpkin recipe of the season! Of course, I have to reference my Healthier Pumpkin Chocolate Chip Muffins which I’m still obsessed with. I am craving Fall so bad. Maybe it’s the fact that today was a high of 90 here in North Carolina. It’s to the point where I’m wearing chunky knit cardigans and making myself sweat just so I can say it’s “sweater weather.” Sigh. My husband and I joked earlier because we were looking at the 10 day forecast and saw 77 and got so excited. October should be full of brisk, chilly days. Where you go for walks and see leaves falling. Where the sun warms your bones – not makes you sweat! Ha. Maybe we will get there…in December! Oh the joys of living in the South. 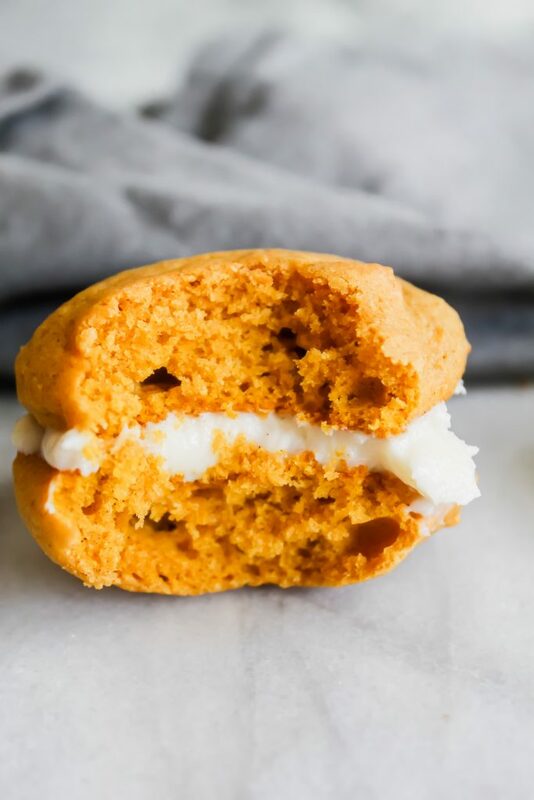 Anyway, these Pumpkin Spice Whoopie Pies are everything I want in life right now. They’re moist, springy cookies that are so delicate. They almost have a cake consistency, spongy and moist. Inside, there is a cream cheese filling that is so wonderful – not overly sweet, the perfect blend of tangy and sweet. Smush ‘em together and make yourself a whoopie pie! But first…what even is a whoopie pie?! Google (aka the dictionary, right?) defines these as “a dessert or snack made from two soft cookies, typically chocolate, with a creamy filling sandwiched in between.” I like how you think, Google. These are most definitely dessert OR snack worthy. 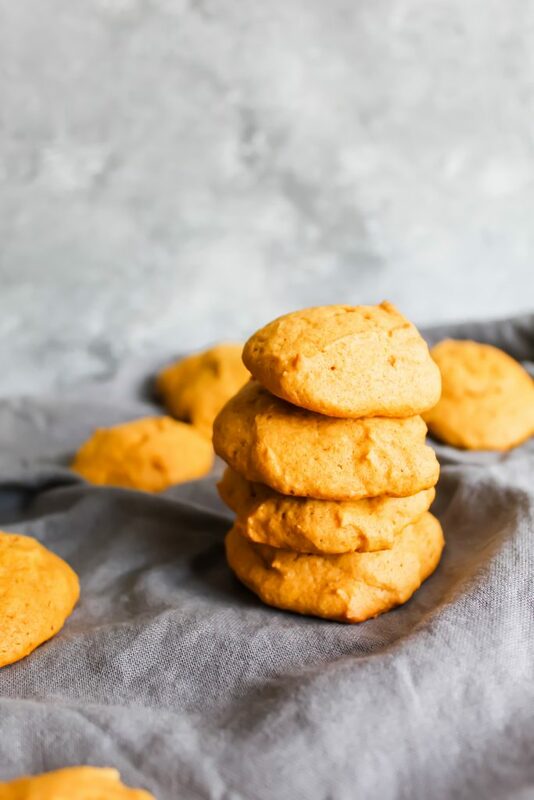 The cookies are insanely soft and filled with tons of pumpkin spice flavor. It’s Fall in a cookie. They almost remind me of a Devil’s food cake texture. You could easily eat these cookies by themselves with a hot cup of coffee. But why not add cheese frosting in the middle and make it a sandwich?! It’s Fall! Let’s be indulgent, okay? 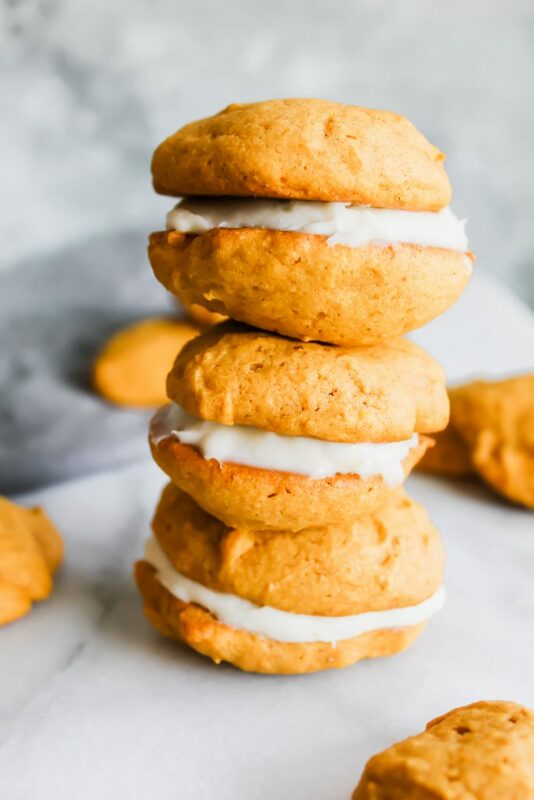 Since I have absolutely no self control when it comes to sweets and I can’t just have 20 of these pumpkin spice whoopie pies sitting around in my house, I naturally shared these with friends. Actually, I served them to the Young Adult small group that Ben and I run through our church. Needless to say, they were a hit. I’m super happy that everyone loved them and even happier that none were left at the end of the night. Re: NO SELF CONTROL. I sincerely hope y’all venture into baking these! They’re so easy but they turn out so delicious you would think you spent hours on them! 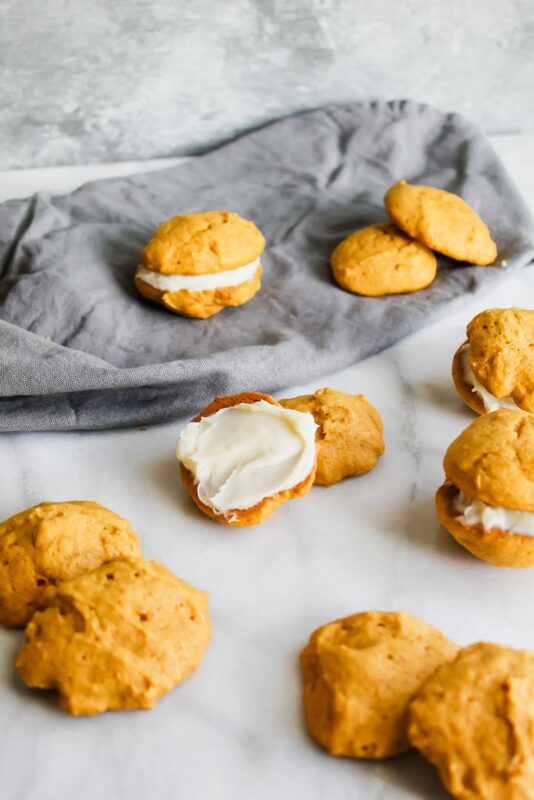 I promise these will be your favorite new Fall treat! As always, if you decide to make these – please tag me on Instagram or Facebook @ourbalancedbowl. I love to see what you guys create! Preheat oven to 350 degrees. Line your large baking sheet with silicon or parchment paper. Beat your softened butter and 1 cup of sugar on medium speed with either a hand-held mixer or a stand mixer for about one minute. Add eggs in ONE at a time until they're fully incorporated. Add in your pumpkin puree and vanilla extract and beat until combined. Into the same bowl, sift your flour, pumpkin pie spice, baking soda, and baking powder. Mix until dough is full combined. Using a teaspoon, scoop out your cookies onto your lined baking sheet. I fit 12 on mine. Note: You don't have to use a fork to flatten them down or anything. They make look a little strange but I promise they will rise. Bake for 10-11 minutes. Immediately move to cooling rack once they are done. Let them cool for at least 30 minutes to an hour. Repeat until all of your dough is baked! Beat the softened cream cheese and butter together with the vanilla extract. Add in the powdered sugar gradually, continually beating until frosting becomes light and fluffy. Once the pumpkin spice cookies are fully cooled, add a generous dollop of the cream cheese frosting on half of them. 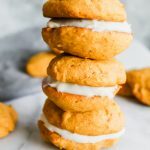 Place the other bare pumpkin spice cookie on top and gently smush them together - making a whoopie pie! Enjoy! Can be stored for up to 2-3 days in the refrigerator in a tightly sealed container. Note: this recipe makes several dozen cookies. You can either line 2-3 baking sheets at a time and bake all at once - or do like me: Bake them one batch at a time.